Rigid Marine M2-Series LED Light Bars are the perfect solution for the customer who wants powerful, bright, and reliable light. 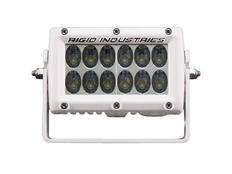 Rigid's patented Hybrid optical system continues to lead the field in efficiency and projection. This patent is one of my reasons that the competition simply doesn't stand up to the quality and performance of Rigid Marine M-Series LED Light Bars. By using the latest Cree and Osram LEDs, USA Made Rigid Marine M2-Series lights project more than twice the amount of light at the same power. Top it off with the fact that Rigid LED Lights come with a lifetime warranty and the choice is clear. The part number for this item is 89361. This is a 4" LED Light Bar / Driving Beam Pattern. So what is Rigid's "Driving Pattern"? Well, Rigid's engineering team came up with their popular Driving Pattern version of their Specter optics system to project light not only far, but also wide. This light utilizes a narrow, oval-shaped reflector that projects both spot and flood beam patterns simultaneously. The result is that instead of a conical beam, the driving pattern creates an oblong beam that maintains a bright center hot spot, as well as incredible horizontal dispersion. The best of both worlds and excellent for driving!